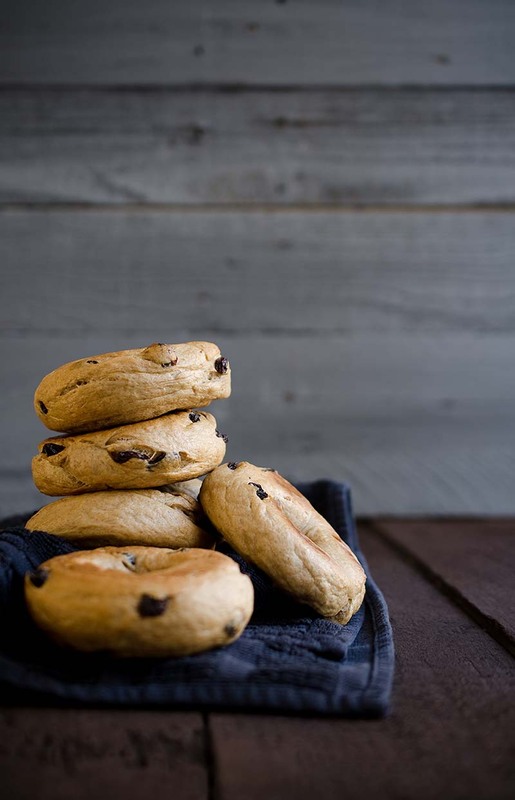 These homemade bagels are a delicious way to start the day. In a medium bowl, whisk or sift together the flour, salt and cinnamon. In the bowl of a stand mixer, whisk together the yeast, warm water and 2 tablespoons brown sugar. Allow it to proof for 5 minutes. Remove the bowl from the stand mixer and gradually knead in the raisins by hand, a few at a time. Use your fingers to separate any clumps and disperse them evenly. Lightly grease a baking sheet. Using a kitchen scale, measure out 3-ounce dough balls. If you don't have a scale, divide the dough into 8 equal pieces. Roll each ball into a 5-inch log. Join the ends and very firmly pinch them together. There will be approximately 1 additional ounce that can be rolled into a bite sized “chef’s” bagel. Once all of the bagels are rolled out, cover and let them rest for an additional 20 minutes. Preheat the oven to 400°F. Bring a large pot of water to a boil, stir in remaining 1 Tbsp brown sugar. Grease a baking sheet and set aside. In small batches, boil the bagels for 30 seconds per side. Recipe created by Savory Simple. Easy. Great tasting and perfect texture. Way better than store bought!